A limited edition of 100 Signed & Numbered Giclees on canvas or heavy paper. The date was July 15, 1953, mid-morning over Sakchu, Korea. Captain Clyde Curtin, 4th Fighter Group, 335th Fighter Squadron, has just checked his six and has spotted a lone Russian MiG-15 diving in to attack from the side. Curtin is part of a 4 ship flight of F-86s in a line-abreast formation. 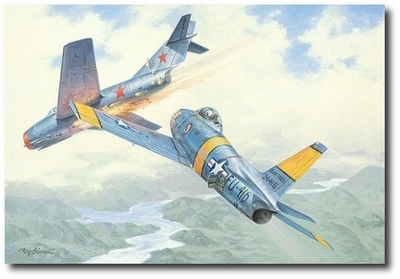 The MiG was at a 3 o'clock high position, and the driver started an attack on Clyde's F-86. Instinctively, throttle to idle, dive brakes, deployed, Clyde causes the surprised MiG-15 to overshoot, passing just in front of him. When Curtin jerked the throttle and deployed the speed brakes he turned towards the path that the MiG was going to take. Without looking through the gun sight, the trigger is pulled and this "Crazy MiG" is destroyed, all in split seconds with not even enough time to warn his flight! This is Clyde's 3rd victory. He will finish his tour in Korea with 5 kills and Ace status.